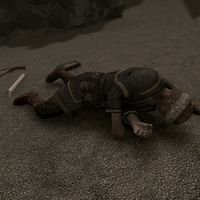 Hugin Ice-Shaper is a dead Nord found west of Raven Rock, in the ash wastes just north of the Earth Stone. He was the Master Artisan responsible for creating Nordic-style jewelry using stalhrim, but he was recently killed and robbed by reavers. You will comes across his murderers standing over his body during the related quest. He is wearing clothes, boots, and a hat, and carries an iron dagger and an apple pie. His body can be looted to obtain the Skeever Cage Key, the Pickpocket's Journal, and a modest amount of gold. The key is required for the related quest. His body is surrounded by several other items, including his pickaxe, a satchel, and Hugin Ice-Shaper's Notebook. You will be required to read the notebook during the related quest, which will teach you how to craft Nordic jewelry for yourself. The nearby satchel contains valuable ore and stones, including the components necessary to craft a piece of Nordic jewelry and complete the quest. Nordic Jewelry: Learn about Nordic jewelry. Hugin is also the author of the Certificate of Authenticity. This page was last modified on 9 September 2018, at 16:32.